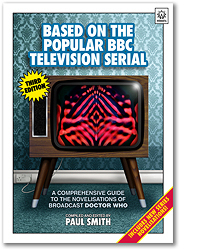 The Third Edition of this comprehensive guide to the novelisations of broadcast Doctor Who is now available to download, with details of all the latest print and audiobook releases — including the new range of New Series adaptations — further information about reuses of the books' cover artwork, and a new essay on the different editions of Doctor Who and the Planet of the Daleks. Every book adapted from the television episodes (plus a few from other broadcast media) is covered, from the Doctor's first Exciting Adventure with the Daleks to the latest adaptations of 21st century episodes. Every edition is listed with original prices and cover details, back-cover story teasers and chapter titles, plus extensive notes relating to the books and their iconic artwork. There's a wealth of information about the original books, their reprints and audiobook readings. Find out which story was novelised the soonest after broadcast; which season is the only one to have all its stories adapted in broadcast order; what New Series episodes have books based on them; which title has the most editions (26 to date! ); where else cover artwork has appeared; and much more. Based On The Popular BBC Television Serial will be kept up to date with new editions as further audiobooks and reprints are issued, and new information is added. It's therefore provided as a fully linked and bookmarked PDF which is FREE for you to download and use on your PC or tablet. All we ask is that if you find the book useful and informative, appreciate the months of work that have gone into compiling it, or would like to support future updates, then please donate whatever you consider an appropriate amount. Click the button below to donate via PayPal and download. Many thanks for your support. Note: The download is a 125Mb Zip file which you will need to uncompress to access the PDF. This is password protected only to prevent editing so should open as read-only; if you have problems make sure your PDF reader (ideally Adobe Acrobat) is up to date. If you want to view the document on a phone or tablet, we suggest downloading and extracting the PDF on a desktop or laptop PC first then sideloading it to your mobile device. To see the range of information included in Based On The Popular BBC Television Serial click through the sample below. This doesn't have full links between entries or the high-resolution images of the PDF but gives an idea of the content.